Does your car pull to the left when you are steering straight? Or, perhaps, you’ve even noticed that your tires are wearing unevenly and you are buying them too often. An alignment could not only keep your travels safer but also save you a good deal of money in the long run. A car out of alignment will surely hurt your budget. The low rolling resistance caused by an “out of alignment” vehicle decreases your gas mileage. Suspension and steering parts get worn through the abuse of vibration. And just like shoes, tires wear how they roll over the ground. A car that is not properly aligned will simply chew through tires. A common misconception is that everything is just fine, when it’s all an illusion. Over time your tires will wear to the imperfections of the alignment on your car. Often a customer will get beautiful, new tires only to have those perfect tires reveal your cars imperfect alignment. Sadly, we see this situation all too often. The best way to keep your car properly aligned is by having it checked every 6 months or 6,000 miles. 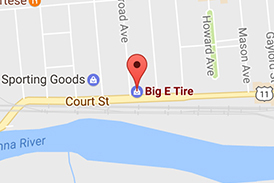 Big E Tire’s certified technicians bring your car to perfect alignment on Hunter state-of-the-art computerized alignment equipment. Once your car is set in place, sensors are attached to each wheel so that the technician can make the proper adjustment determined by the computer. When they are finished, your tires will all be perfectly parallel with you steering wheel centered offering a smoother, safer ride, all while the extending the life of your tires. From value to safety, Big E cares. Be sure to Schedule an Appointment with Big E today!